Clock It is a series of 21 improvised dance solos of 2 minutes 30 seconds each. The dancers have been chosen from a diverse range of performers and are encouraged to perform in any way they wish. Dancers are sourced from the local community and come together for the first time in the afternoon of the first performance. At this gathering the concept of Clock It is explained in greater detail, there is a group warmup followed by a communal meal. The performance follows. I wanted to create a show that was inclusive and at the same time was of high quality. I was keen to celebrate the distinctive differences of each dancers practice. My view is that if you ask the right people, give them the opportunity and have faith in them, great things will happen. Clock It is about community as much as it is about individuality and of course as it is about Art. The style of Clock It is one of freedom. Artists can perform in any way they want for 2’ 30”. The time limitation encourages the performers to be succinct. This clarity and diversity is engrossing and captivating. The excitement of bringing a community together for a performance is also important. The experimental nature of Clock It allows for surprises and new experiences for artists and audience. Clock It is one whole piece made up of many parts. Each solo is run consecutively creating an evolving show that is the sum of the varied personalities and styles of the performers. A digital clock projected on a screen returns to zero after each performer. The music as well as the performance is continuous. Clock It is always an experiment that involves risk taking. The challenge of engaging with the improvised nature of the show reveals the individuality of each performer to the audience and plays out as a psychological thriller. The performers are on stage during the whole show and get to experience each others contribution. This influences their own choices and feeds back into the show. What the performers do is completely up to them. They can contrast each other, go with the flow or play with the performance dynamics. They are encouraged to be flexible and adaptive in their performance, be themselves and have fun. The performers are seated in chairs along one end of a rectangular space. At the other end of this rectangular space are 20 chairs behind which a digital clock will count down each dancers time. Each performer makes a journey from one end of the space to the other. There is a physical and metaphoric leaving and arriving that plays out dramatically throughout the show. The audience sits facing each other along the other 2 sides of the rectangular performance space. 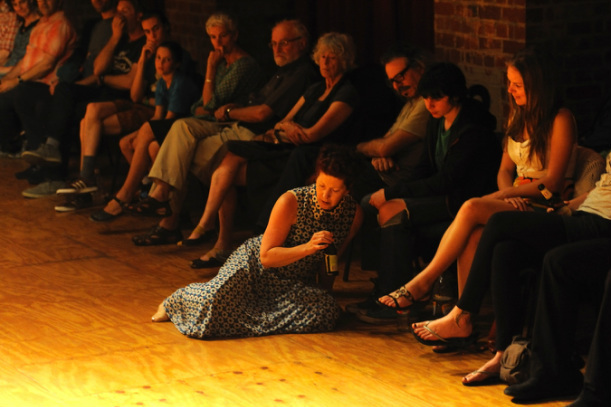 This creates an intimacy where the performer and the audience are always in close proximity. There are no rules regarding costume other than encouraging performers to give it some thought and wear something they feel comfortable in. There is a process for curating performers and also a running order that the Artistic Director is responsible for. He will lead a concept briefing, a group warm up and answer any questions the performers may have regarding the show. David is also in charge of working the digital clock projection during the show. Liaising with the local performance community is integral to the event. Performers are sourced from the dance and physical theatre community and this involves networking months in advance of the event. Conversations, meetings and suggestions with the community take place via email, Skype, telephone and face to face where possible. Michael will improvise with a wide range of live and sampled sound and music however there is no prearranged composition. He will interact with each performer, making offers, responding in the moment to the space, individual contributions of each performer and to the larger evolving aesthetic of the complete show. There is the possibility for creating a diverse range of shows with a particular theme or involving particular community groups. This could be on the basis of age, gender, cultural background, disability, geographical location, performance style or any combinations of the above. Clock It is keen to create opportunities for performers and communities of all kinds. As part of the performance a photographic exhibition of previous Clock It events featuring the work of Paul Dunn is also an option.